For those planning to visit Peru, Cusco is an obligatory stop, whether you are going to Machu Picchu or not. There are many things to do in Cusco, including amazing historical sites to visit, so make sure to plan a 3 or 4 days stay in the city. If you are coming directly from Lima or another city located in a low altitude, remember to spend at least the first day in Cusco, resting in the hotel to acclimatize, since the altitude sickness can be an issue. Considered the most beautiful city in Peru, Cusco is, besides beautiful, full of history. The city was built by the Inca Manco Capac in the 12th century to be the administrative capital of the Inca Empire, it was here that all the Incas used to leave, and many walls of their old palaces can still be found around the city. When Cusco was first built, it had the form of a puma, a sacred animal for the Incas, where Sacsayhuaman, a famous ruin that can still be visited today, used to represent the puma’s head. Cusco remained the capital of the Inca Empire until 1532 when it was invaded and looted by the Spanish. 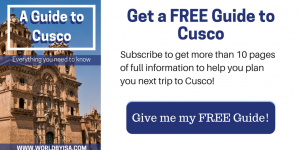 To help you plan your visit to Cusco, make sure to download the completely free guide to Cusco, you just need to subscribe, in there you will find more than 10 pages of information with a list of the best trails and day trips to take! This is the best way to get to know a city, Cusco has two groups of Free Walking tour, both starting the first tour at 110:00 am. Free Walking Peru’s meeting point is in the Plaza de Armas, next to the fountain, while the other group, Free Tours by Foot meets at the Plaza Regocijo, also next to the fountain. 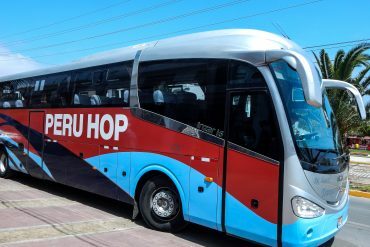 This is a fun activity where you will be able to learn more about the history of Cusco while visiting the most important points in the city while making friends along the way. 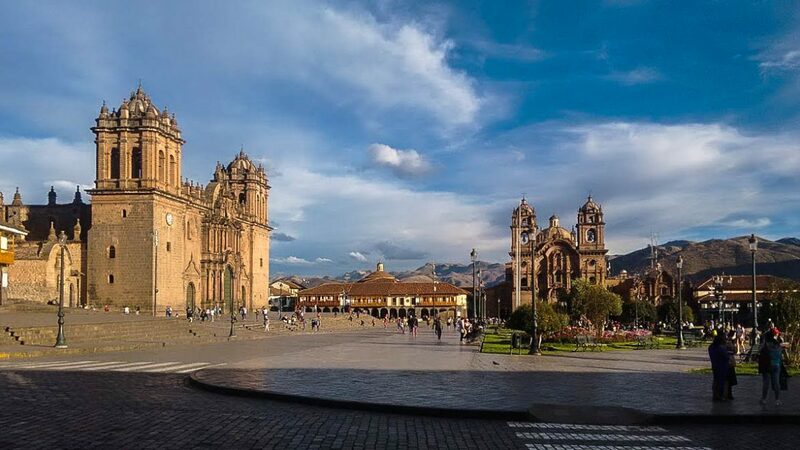 The main Square of Cusco, that’s where the Cathedral of the city is located as well as La Campania, one of the main churches in Cusco (read next). The garden in the center is surrounded by flowers and has a beautiful fountain, picturing Pachacutec. It is in this square that all the important things, like celebrations, protests, etc happen. It is a beautiful place to spend the sunny afternoons but also a lovely place to spend the night, there are many bars and restaurants and the atmosphere this area at night is amazing. The main cathedral in Cusco, located in the middle of Plaza de Armas, the main square. Built in 1654, in the area were once the palace of the Inca Wiracocha stood, the Cathedral houses nowadays the Roman Catholic Archdiocese of Cusco, inside you will also find small artifacts and relics from the Inca Empire and the Colonization era. To visit the Cathedral you have to pay a fee at the entrance, which is something around $30 soles. Another church located next to the cathedral in Plaza de Armas. It was built by the Jesuits in 1571 upon the palace of Huayna Cápac, one of the last Incas of the empire. The church was built to be the most beautiful in the city, however the idea was turned down by the papa himself, due to the fact that the La Campania wasn’t the main church in Cusco, and it was located next to the Cathedral, which was supposed to be the most beautiful and sumptuous building in the whole city. The ruins of an old fortress located really close to the main square and can be visited by walk leaving from the city center. 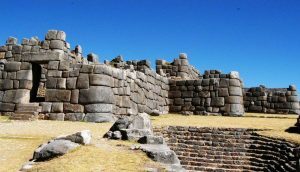 It was built by the Inca Pachacutec and back in the time of the Incas when Cusco used to have the form of a Puma, Sacsayhuaman used to be its head. From the distance, it is still possible to recognize the form. 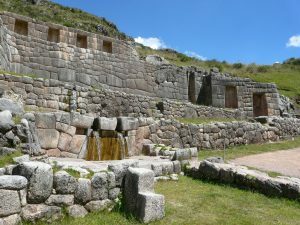 To visit the Sacsayhuaman as well as the other ruins next to it, it is necessary to buy a ticket that includes the entrance to these sites. Tambomachay, from the Quechua “Bath of the Inca”, was the place where the Incas used to go to purify their bodies and souls from bad spirits. This is another ruin located close to the city center that is included in the ticket mentioned above. 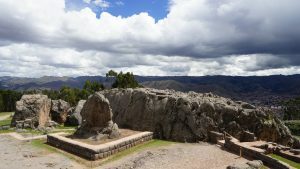 Although it too can be visited by walk leaving from the central area of Cusco, I would recommend taking a tour or a bus to visit this and the other ruins altogether. 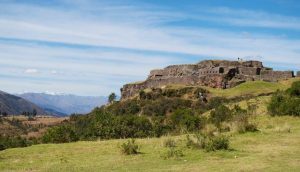 Located next to Tambomachay, Pukapucara means “Red Fortress” and used to be an Inca fortress that protected the people from attacks coming from Amazonian tribes. The entrance for this site is also included in the ticket mentioned above. Qenqo is believed to be religious site related to death and blood sacrifices, this is the place where the mummification of noblemen used to take place. One of the most well-preserved ruins near Cusco, hidden between mountains, it is not so well known, which makes the place more chill and tourist free. Tipon is formed by many terraces used for agriculture by the Incas, fountains, water channels, and aqueducts, some of which are still in use nowadays by the locals. It was first built to be the Temple of Sun, the most important god for the Inca people, its walls and floors used to be made of full gold with statues also made of gold decorating the yards. Qoricancha temple was destroyed by the Spanish and on its place a church was built, it is still possible to see nowadays parts of the old temple, as the church was built on the temple base. A traditional market that sells everything, from food to souvenirs. The prices are way cheaper than in the city center and the market is really easy to get to. If you wish to feel like a local, you can have lunch there to eat local dishes with the locals. This is the best viewpoint of the city, from there it’s possible to see the main square and all the central area of Cusco. You can take a bus there or climb by walk. The Inca Museum is definitely the most important of all the museums in the city. It keeps many artifacts of different people from the Pre-Inca area to the Inca Empire, including people from different regions of Peru. It is possible to learn a lot about the history of these people in the museum. A stone located in the middle of the most well preserved Inca wall in a small street, that used to be an Incan road in the past, known as Hathunrumiyoc. A lot is said about the mystery behind this stone, some believe it was a form of a calendar of the Incas, while others dare to say it is a form of portal. Going up through the Hathunrumiyoc, you will find yourself in San Blas District. The neighborhood has strong colonial architectural influences. The highlights are the main square and the small San Blas Church built in 1544 over an ancient Inca temple. Located in the San Blas district, this is one of the best viewpoints in the city, especially if you are looking for a scenic view. Located next to Sacsayhuaman, the planetarium offers its visitors not only the chance to gaze at the stars but also a cultural experience, learning more about the Incan astronomy. Built over the “Amaru Cata”, the school of the Incas, nowadays houses more than 400 masterpieces from different periods, the museum is dedicated to the Peruvian art and exhibits art from different Peruvian tribes. One of the most important colonial churches in Cusco. Next to the church there is the entrance to its museum where it is possible to see many paintings representing the life of San Pedro Nolasco, founder of the order La Merced and the tomb of some famous conquistadors, the collection also includes the famous jewel “Custodia de la Merced”, made of pure gold encrusted with diamonds, rubies, emeralds pearls, and topazes. A living museum where it is possible to learn about the products made from the local camelids (llamas, alpacas, guanacos, and vicuñas) from the beginning to end, from watching the animals learn how the wool is dyed and how the clothes are made. “In 1911, Hiram Bingham III climbed into the Andes Mountains of Peru and “discovered” Machu Picchu. While history has recast Bingham as a villain who stole both priceless artifacts and credit for finding the great archeological site, Mark Adams set out to retrace the explorer’s perilous path in search of the truth—except he’d written about adventure far more than he’d actually lived it. In fact, he’d never even slept in a tent. 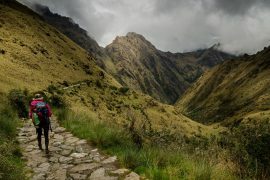 Wow, we need to take the kids to Peru ASAP…your pictures are so beautiful! This is awesome. I’d like to go to Machu Pichu, so I would probably spend some time in Cusco. Thanks for the tips! Thank you for writing this list! I had no idea there was so much to do in Cusco, I honestly thought you just had to go because it helps get over the altitude sickness! I’m even more excited about my trip there now! Oooh! Peru has been on my bucket list for too long! Will have to put Cusco on my dream itinerary! Thanks for sharing. From the amount of cool things you have listed, I would need longer than just a few days to explore the city. Thanks for the great pictures, now I feel like I took a mini vacation there. Someday I will have to actually visit though because it looks fun and educational which is my cup of tea. 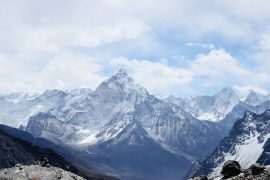 Most people don’t know about altitude sickness, but being from the mountains I can attest it is real. Good work letting people know. Thank you for all of this information. Looks like an amazing place to visit. Like many people, Peru is high on our list. I like to hear that there are many things to do while you acclimatize. So often people focus on Machu Pichu which is amazing and worthy. However, I am really happy to hear the experiences on the way are as impressive and culturally immersive. I love learning about the history when we travel. You have done a great job of sharing the history in this post. Thank you for posting and hopefully one day we can use your eBook tips to visit Cusco ourselves. Loved your pictures I love visiting rural and less populated areas too. Cusco was my favorite spot during my trip to Peru. The pictures are great – did you take them (since they are credited with flickr and no name). Thanks for bringing back memories of my trip to the Andes. Happy travels and merry season’s greetings! Thank you, Renata! 🙂 Not all the photos, those who are credited to Flickr are not mine, the others were taken by me. This is great! I am planning on going to Machu Picchu and Cusco soon. Will definitely use this guide in my planning. Absolutely loved this. What amazing photographs. Can’t wait to hear about your future travels. Hopefully I can travel to there one day! Oh and I thought Cusco did not have much else to see except a visit to Machhu Pichhu. Thanks for this really elaborate list, not sure when I’ll get to visit Peru but will bookmark your post for easy reference. I almost cry when I saw this post. I haven’t been there since 2008. Great guide, I loved reading about Cusco. I know most just stop by on their way to Machu Picchu, but it’s should be explored on its own. Never been there but now if I go I’ll know what to see. These photos are gorgeous! I want to visit there someday. I am absolutely in love your blog. It so useful and soo much on this blog post. This makes me want to book a flight to Peru. Keep up the great work. Excellent list! All is a must. We have just recently spent 2 weeks in Cusco and also wrote about it on our blog. 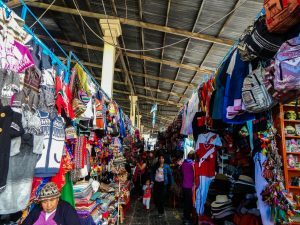 But this blog entry is a must read for anybody planning on going to Cusco! Great getaway for a Machu Picchu trek or Rainbow Mountain. And the San Pedro Market is a pearl! I’m not planning on going to Peru anytime soon BUT I felt like I got to go to Cusco because of the lovely pictures. Great list of stuff to do — thanks for posting! Woo! Looks pretty awesome! I love old towns and castles! 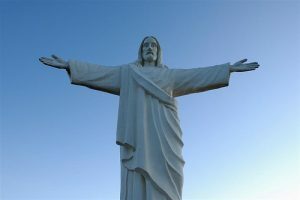 I hope I will go there one day. So beautiful and attractive. Thanks for sharing me. Cusco is pretty amazing and I agree there is lots to do in this city before exploring the ruins around there. I loved it and would def do more exploring myself. 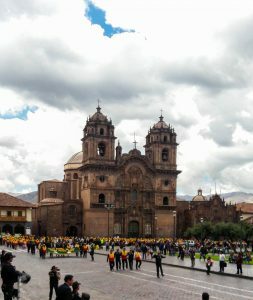 Cusco is an amazing city – I never thought of visiting but after reading this post, it’s definitely somewhere I want to explore. So rich with history and culture, such a delight for travelers! Mi husband is Peruvian and we go every year! My MIL has a home in the valley of the Incas overlooking the Andes (which you can rent, if anybody is interested you can see it at http://www.villaruna.com) and I absolutely love this area. 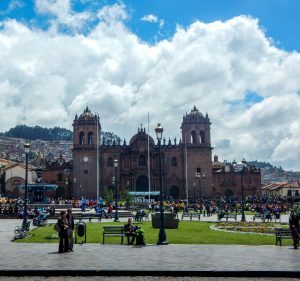 Cusco city is also beautiful as well and these recs are right on! Thanks for sharing!